I’ve been thinking a lot about budgie cage set up lately, possibly a consequence of now having two flight cages! 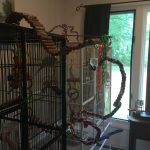 We put a big emphasis on changing up their cages regularly, I recommend weekly switching at least a toy or two out and moving some perches. 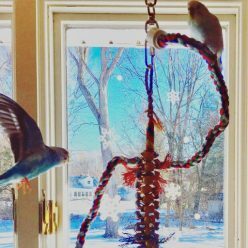 Budgies are very intelligent and can be prone to boredom, so it’s a good idea to keep them engaged in their space and not let home become stale. I’m sure there are some budgies out there that hate change, so your mileage may vary and use your judgement. In addition to the interior space, it’s also important to think about maximizing exterior cage space for budgie enrichment. 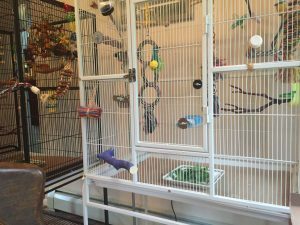 Utilizing exterior cage space is also a great way to help your budgie feel comfortable out in the “world” that is your home. One idea is making a fun space on top of the cage so your budgie has a place to hang out. 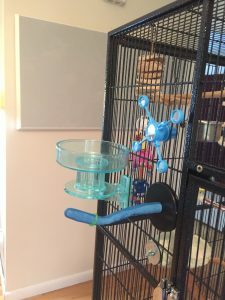 We used a Booda Comfy Perch and a Super Bird Creations Wind Chimes Toy for Birds to create a fun and budgie friendly play location on top of Toby’s cage. We added a cluster of Vine Balls trailing down over the side to provide even more indoor/outdoor play options. Toby’s cage also has a perch placed outside underneath her main door to ease the transition into the cage, which can frequently be difficult to navigate. It’s also a sand perch , which she loves but I know can be hard on budgie feet. So placing it outside the cage means Toby gets time with the perch but without the risk of her trying to nap or sleep on it and hurt her feet. Kelly’s cage has a totally different flair. 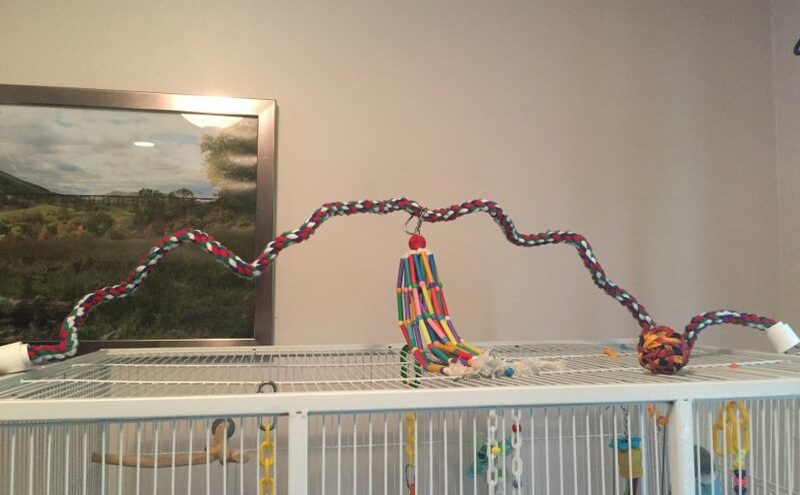 She has a Bendable Wooden Bridge that comes off the top like a ski jump, as well as a Spiral Boing Perch that connects to a Natural Rope Ladder and then back to the edge of the cage. Kelly also has a Sand Perch outside her cage, but hers facilitates entry into the Lixit Quick Lock Bird Bath . The Lixit bath is still one of the most reliable ways to get Kelly to clean up and having it mounted on the outside of the cage makes it easier to clean up the inevitable water-soaked “splash zone”. 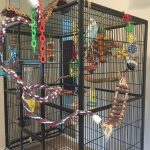 Adding areas of interest to the outside of the cage helps parakeets transition from indoor to outdoor space while still keeping a sense of safety and being “home”. 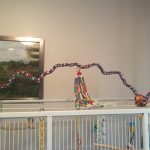 This can be a big help during the initial taming/training process, but is also just a great plan to keep your budgies engaged outside their cages. 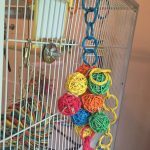 Expanding your budgies’ livable space and maximizing enrichment can really enhance their lives overall.